We would like to take a moment to welcome our new chairs! Firstly a big thank you to our previous chairs Jacob and Ryan who have helped the Youth Council immensely over the past year, in terms of streamlining, leadership and diversity. Both chairs have made the Youth Council more notable and more efficient and we are sad to see Ryan go. 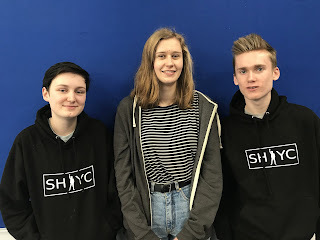 We are happy to welcome a new co-chair Millicent (middle) who has been a councillor for 3 years and now has the chance to lead and bring new ideas alongside Jacob who is staying on as a chair. 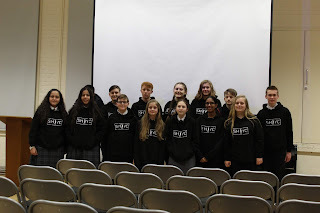 The Surrey Heath Youth Council are continuing their manifesto commitments by starting a new project to tackle discrimination. At first, we are aiming to focus on discrimination brought about by a lack of awareness and are looking at disabilities and age. We hope to challenge discrimination around disabilities by raising awareness and educating other young people, while in our age project we hope to challenge underrepresentation of young people by getting them more involved with local decision makers such as their borough councillors. The Surrey Heath Youth Council are immensely proud to have received a Diana Award for their work to reduce the stigma around mental health, open up discussion and increase awareness of mental wellbeing in Surrey Heath through their Anti-Stigma Conference. Members of SHYC went to London to receive the award and were inspired by the experience of seeing so many other young people with outstanding achievements. The full list of 2018's Diana Award holders can be found here. This has motivated us to continue working even harder on our current project after summer to ensure that we can get the biggest impact possible and benefit the young people we represent in the most powerful way.